Extra soft overnight moisturizing gloves protect hands and help heal roughness overnight! Set of 3 pair made of washable, comfortable cotton. Imported. Wear white cloth gloves over your own hand cream at night for deep penetration and moisturizing; cream can't rub off onto sheets. I have a hand condition, my hands crack and bleed, I worry about catching something for my hands being exposed, these gloves are great. They keep my hands dry and cleans. Diabetic neuropathy along with extremely dry skin is a major issue for me. My hands and cuticles feel much better in the morning after using these gloves with heavy hand creams and ointments over night. The price of the gloves from the Easy Comforts website is MUCH less than buying from other major retailers. A real bargain at a great price. They keep my hands warm! I love these gloves- much better quality than I've found elsewhere. I use these to put on my compression stockings without causing snags or runs. I will also use them for nighttime moisturizing. These hold in all the greasy moisturizers and keep them on your hands and off of the sheets at night. New soft hands in the morning. These gloves are just what I've needed . I have diabetic neuropathy which has moved to my hands that makes them very painful. I have a greasy medicine that I have to put on them and the gloves keeps me from getting the grease on everything. The gloves aren't to tight or to loose and I really like them and I sleep in them too. Cotton gloves are hard to find. I use them for nighttime use over hand cream for dry skin ~ especially dry cuticles. These work great. These cotton gloves are just the ticket to soften hands which tend to get dry, especially in the winter. Slathering on hand lotion then putting on the gloves to wear overnight has your hands soft and smooth in the morning. hands and cuticles soft ! And warm . These gloves are prefect for what I needed them for. I really need these gloves in the winter time. My hands get so dry. I put lotion on and then the gloves, and in the morning my hands feel so good and soft. If these came in more sizes they would get 5 stars. My husband gets very cracked fingers in winter, these helped but are snug. I wear gloves with lotion at night. I use these at night to keep my hands and fingers warm. They work great but after 20 years, I need more. My hands are dry and during the day I'm always haven't to get my hands wet. the gloves keep my hands warm while reading. Good reviews. I need to replace my current set of gloves. Price looks good. To put cream for my dry hands. I haven't been able to find them in my town nor any other place. Living in Minnesota in the winter dries out my hands. These are so I can apply moisturizing lotion at night and sleep with it on, for deep-penetration. So my cats won't lick the lotion offy hands at night. Because they are nice to have to cover my lotioned hands at night. Dermatologist said it will help with my dry skin. I was looking for this type of glove and only found them on this website. My hands are chapped and cracked and wanted to try these to see if they will help with the soreness and irritation. My hands are dry & this seems like the best time of day to fix that. To keep the cream I put on my hands at night from getting on my bedding. I have dry hand and hope they will keep my hand cream on. Dry, itchy spots on hands. Hopefully these will help keep lotion on hands overnight. I had a pair years ago and they do wonders. 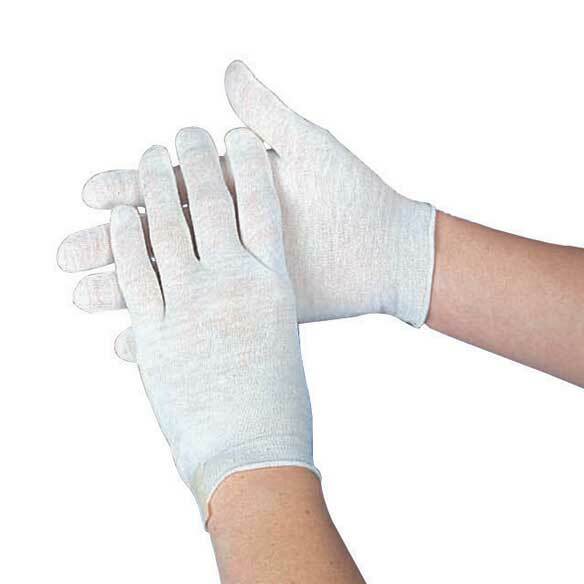 Cream your hands and put these on and the next day your hands are like new. Because my hands are so dry and they hold moisturizer cream in overnight. I use these gloves for night time moisturizing my hands. How are these gloves sized? Don't know how to choose correct size. BEST ANSWER: Thank you for your question. We have included sizing below.We hope this information will be of help to you. BEST ANSWER: Thank you for your question. The gloves are 100% cotton. We hope this information will be of help to you. BEST ANSWER: I bought about 9 pairs and use a clean one each night. They are lasting great. I put vaseline on my hands each night and then on with gloves. I put the used pairs in a wire basket till I do laundry (twice a week for the white loads - not towels) Before I wash them, I rinse them in really hot water and then put the stopper in the sink with Dawn foam (about 6 squirts) and then keep squeezing them out and then rinse and put in the white load. Otherwise vaseline or lotion can get on your clothes. They are holding up great!! The gloves are very durable! I am still using the first pair and have not had to consider using the other two pair. Can these gloves eliminate the need to cut cuticles? BEST ANSWER: Every night I use Rosebud Salve on my cuticles and then the gloves. They are just cotton gloves. My cuticles are smooth and healthy ! BEST ANSWER: Thank you for your question. These re made of a comfortable cotton.We hope this information will be of help to you. Yes they are a very light weight cotton knit. They have a little stretch to the fabric, are very comfortable and work very well. Laura B.
I have short stubby fingers so what size should I order? MED/LG: WOMEN'S 7 1/2-8 1/2 GLOVE SIZE. We hope this information will be of help to you.